Day 33: The Birth of Hope | You Can Shake the Gates! Day 33: The Birth of Hope – You Can Shake the Gates! Lord, now you are letting your servant depart in peace, according to you word; for my eyes have seen your salvation that you have prepared in the presence of all peoples, a light for revelation to the Gentiles, and for glory to your people Israel. 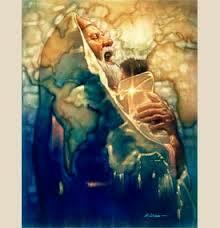 Anointed and prophesying, Simeon gazed into the realm beyond time and space, seeing in Jesus’ face the eternal. At once he saw baby and salvation. In those baby blue eyes he saw light and revelation for peoples living at odds with God. Raising the child in his hands he saw the glory of Israel. For all eyes to see, there was the child whose coming was prepared in the sight of all peoples: even eastern star gazers and scroll readers, looking for the One born King of the Jews. Tears soak my beard. This Son is my savior, my king, my light, my hope. This hope was revealed to Gentiles, too–my ancestors were Welsh-Irish, not Jewish. What life would I have had if Jesus’ father hadn’t swept him away to Egypt to escape Herod’s murderous wrath? Had Jesus not offered himself in my place, I would have suffered the horror of eternal separation from God. Wet beard, bleary eyes, full heart, I, like Simeon, can hold this child before you and proclaim that salvation and revelation and light and glory has come! I have a friend in Papua New Guinea named Ezekiel. He was already in his thirties when I came to know him and he’d been advocating for literacy, Bible translation and awareness since he was a school boy. He actively waits for the day when the word of God will be available in his heart language. “Active waiting” for Ezekiel means plodding day after day, drafting, translating, checking, sharing, preaching, teaching, leading: moving people toward the Bible and moving the Bible toward the people. A few years back he became exceedingly ill and spent months in the hospital. Though weakened in body, his zest and gusto remain full strength. Though he fights constant pain he continues to work on translation, preparing for the day when we can revise, check, and publish the fruit of his labor. You must pray with us that this day will come when our brother will be able to depart in peace, having accomplished the God’s grand purpose of his life. Stay informed and inspired to pray for the Somau Garia translation team by clicking here. If you’d like to partner with Pioneer Bible Translators in sending us out to get our boots on the ground in Papua New Guinea and get moving forward on finishing translation of the Somau Garia New Testament, click here to visit our Donate page where you will find instructions on how to do so. This entry was posted in Ministry News & Opportunities, Shake the Gates Press, Uncategorized and tagged hope, intercession, Jesus, love, mercy, prayer, Somau Garia, translation. Bookmark the permalink.